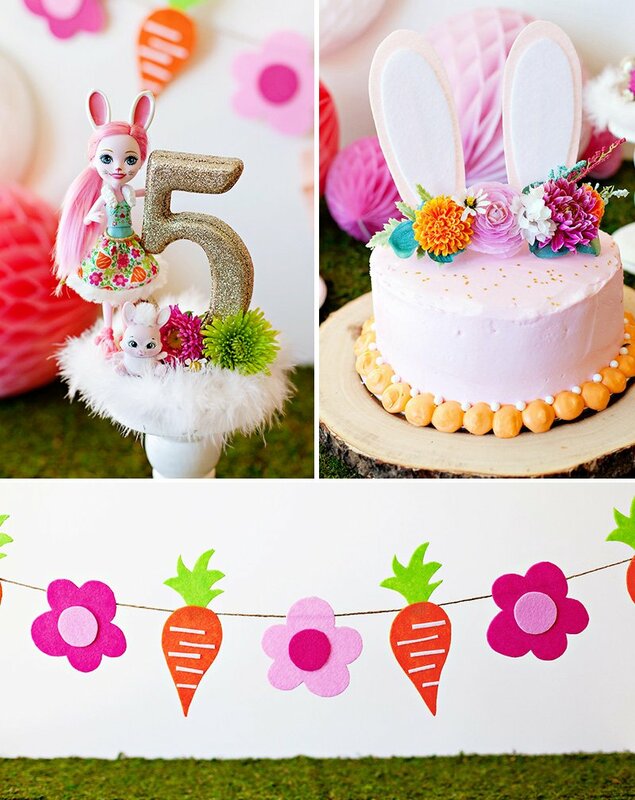 With Easter coming up soon, it feels like a great time to share these DIY Bunny Party Ideas that I recently designed for Enchantimals! 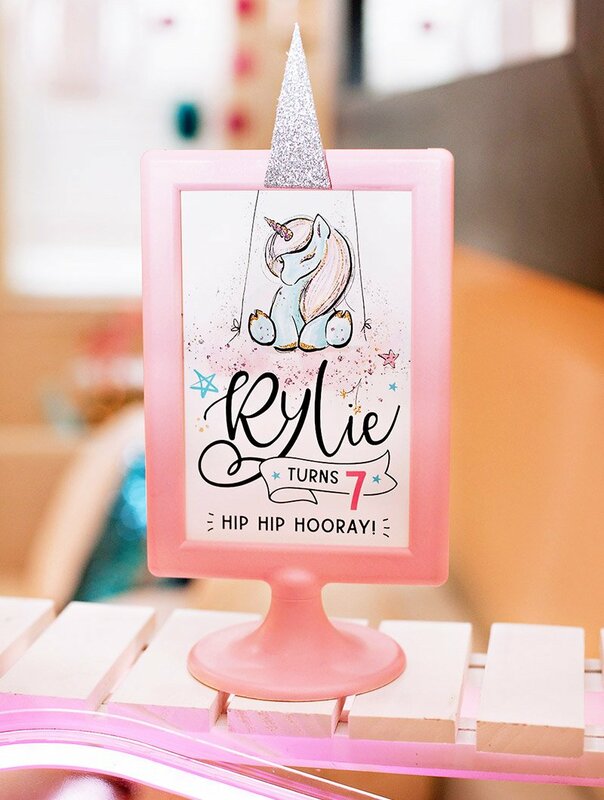 They were inspired by the look of the adorable Bree Bunny doll and her furry friend Twist. 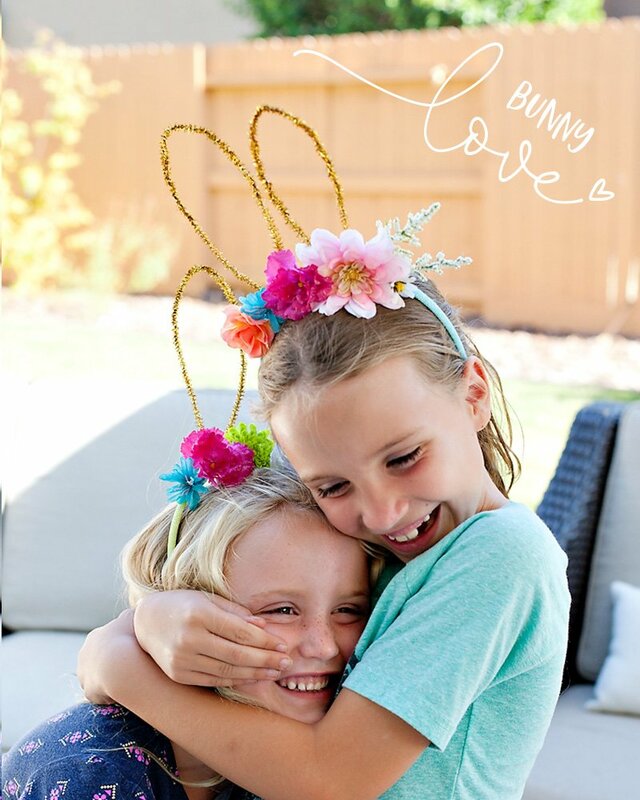 Bree’s signature style includes bright pink hair, a colorful carrot-and-flower-print dress, and – of course – bunny ears! 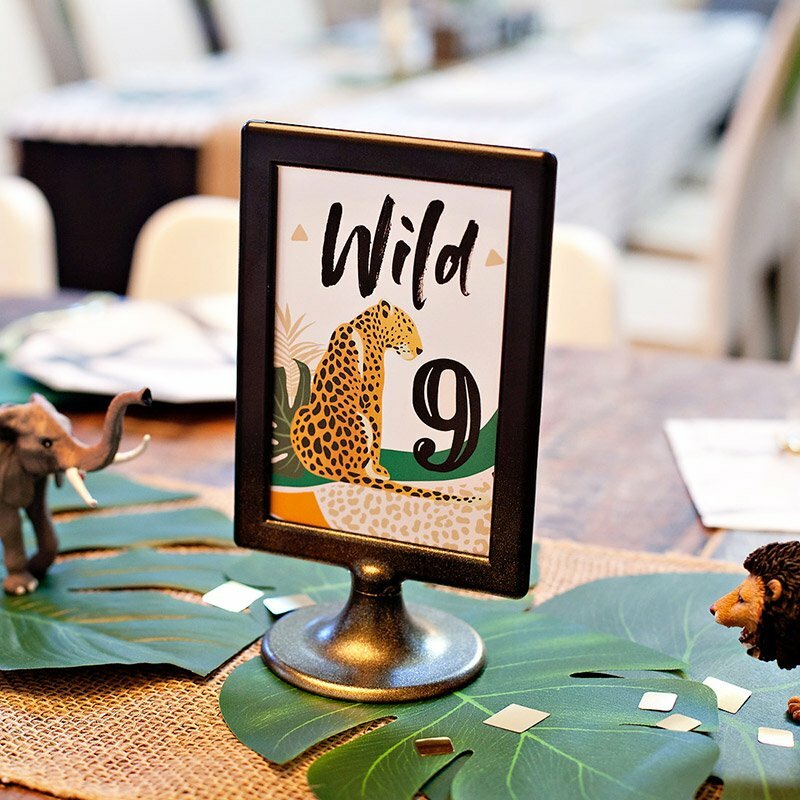 Although initially designed for a birthday, these ideas would work well for lots of other bunny-inspired celebrations too, from a sweet woodland baby shower to an extra-creative Easter brunch. I also worked with the Enchantimals team on instructional videos for 2 of the projects – the Bunny Flower Crown Headbands and Bunny Cinnamon Rolls. In addition to those videos, here are close-up images of all the different ideas. Enjoy! 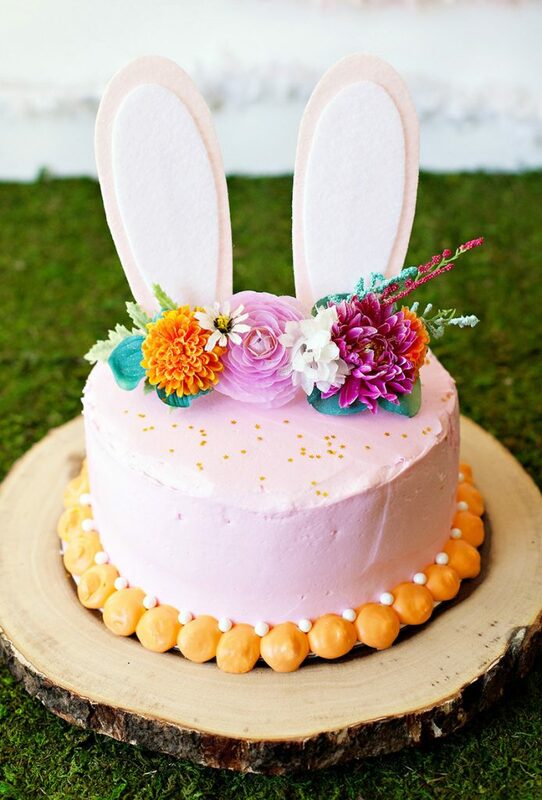 Make a simple round cake party-ready with set of felt ears and some faux flowers! 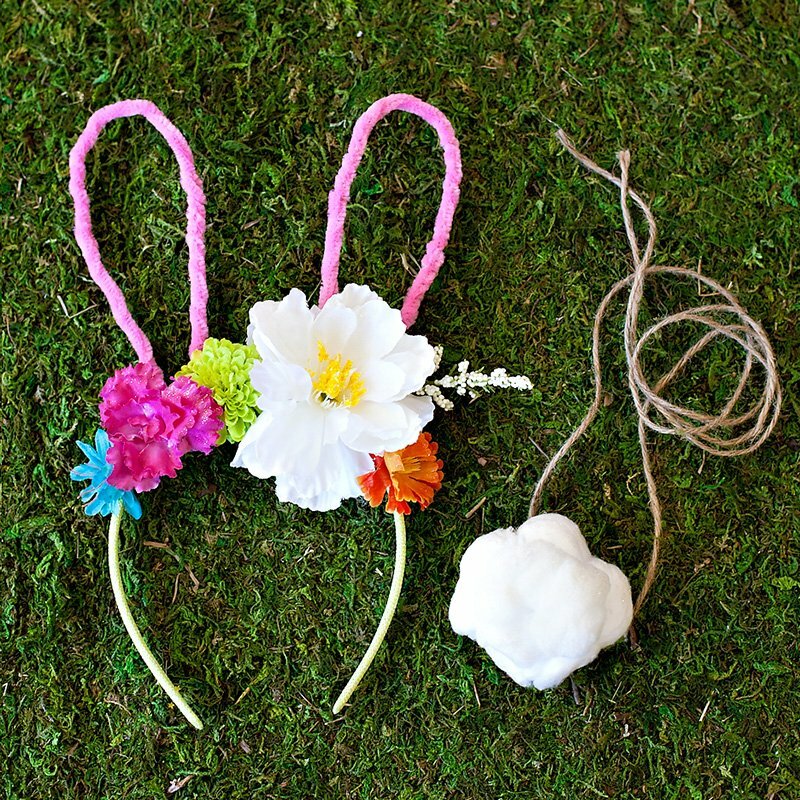 Make sure to use stiff felt so the ears stand up straight, and hot glue them to bamboo skewers. 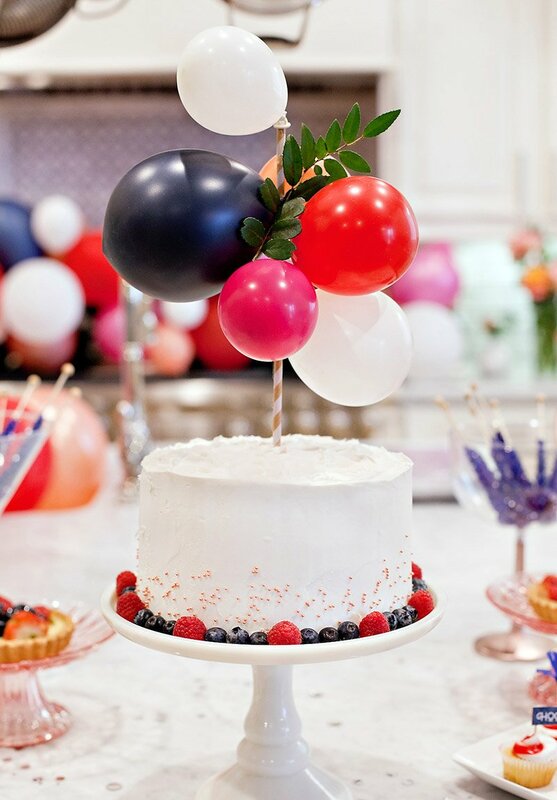 The faux flowers are glued across a wide popsicle stick with small wood dowels glued to the back and inserted into the cake. 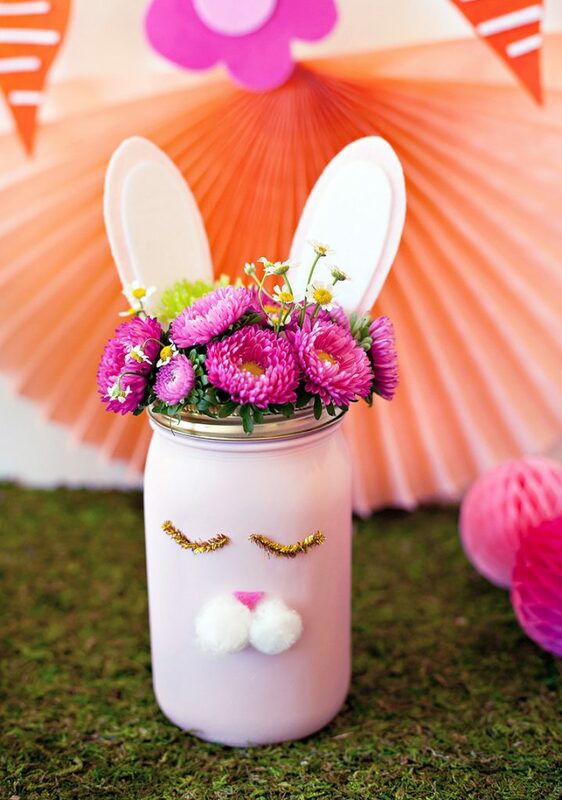 This sweet “enchanted bunny” mason jar is perfect for holding flowers or favorite treats! The face is made from pipe cleaners, felt, and cotton balls. I spray painted the outside of the jar a light ballerina pink. 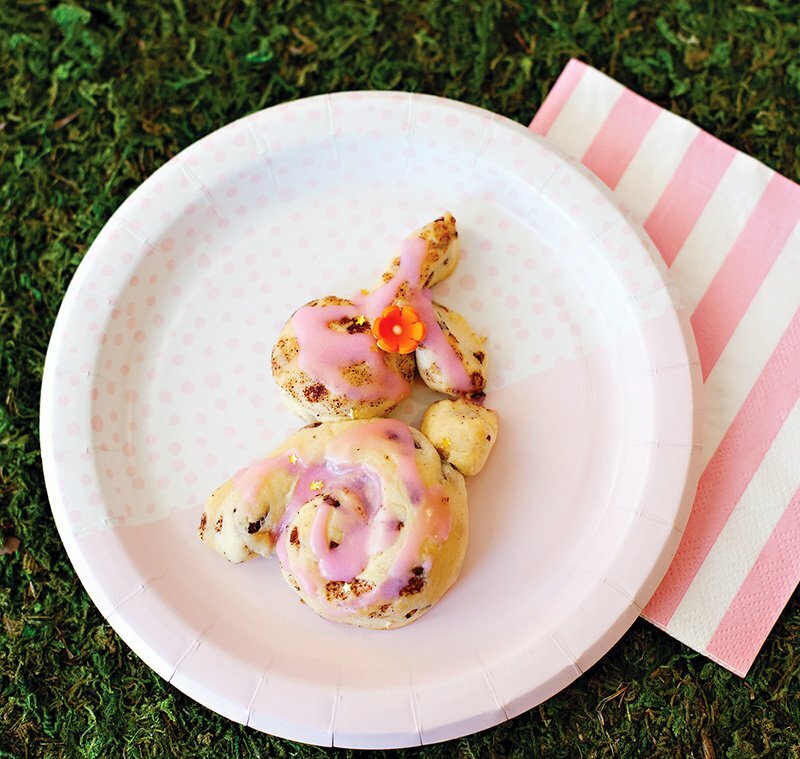 I am a huge fan of cinnamon rolls, so this idea might be my personal fav! 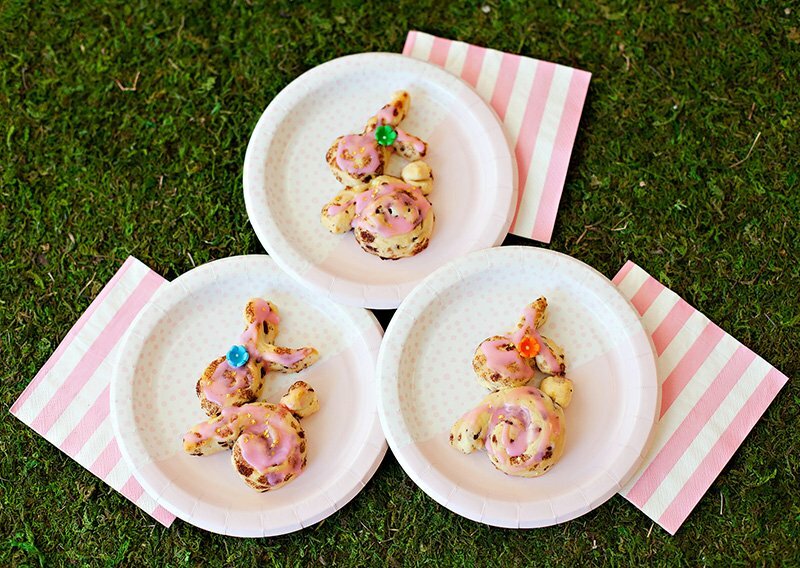 Watch the DIY video for the details on how to make this easy bunny treat using a tube of store-bought cinnamon roll dough. 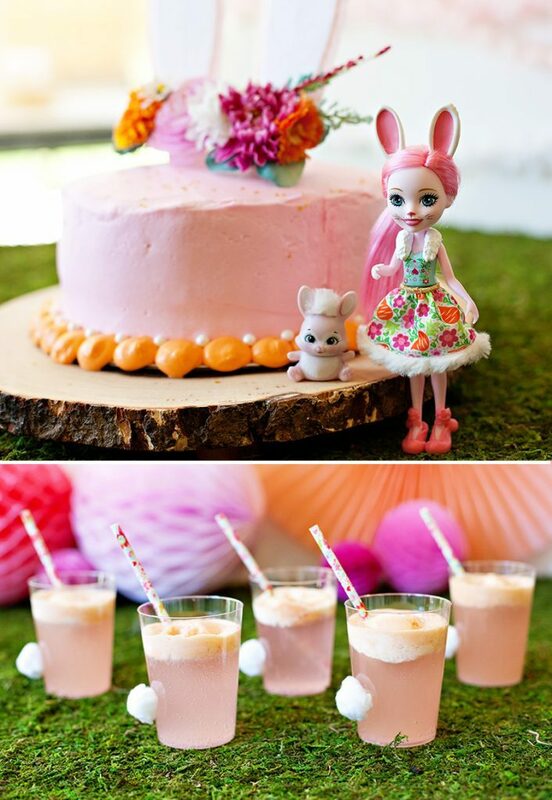 One more fun fact about the Bunny Bree doll… I love that she’s described as “the craftiest of all the Enchantimals”. Pretty fitting, right?! P.S. 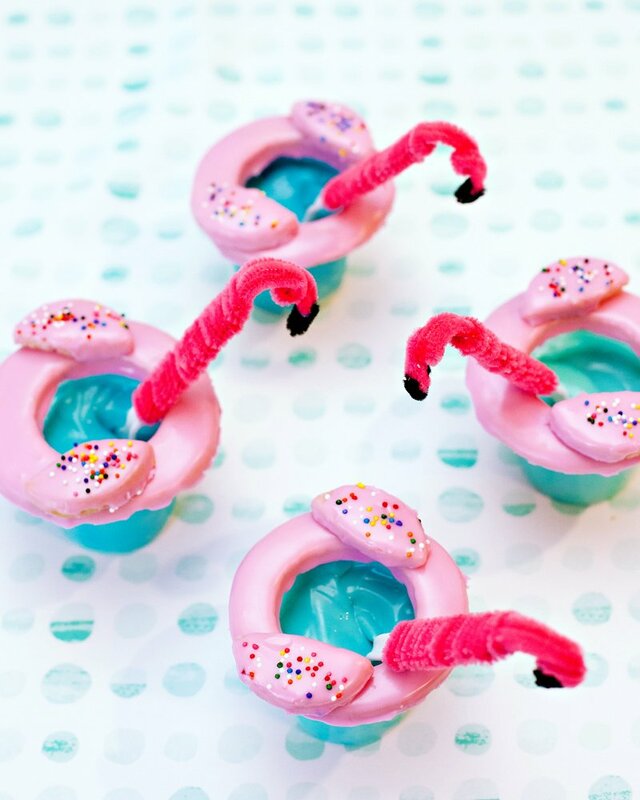 For more DIY Enchantimals fun, check out my Fanci Flamingo doll inspired Flamingo Pool Float Donuts and Flamingo Party Bags! 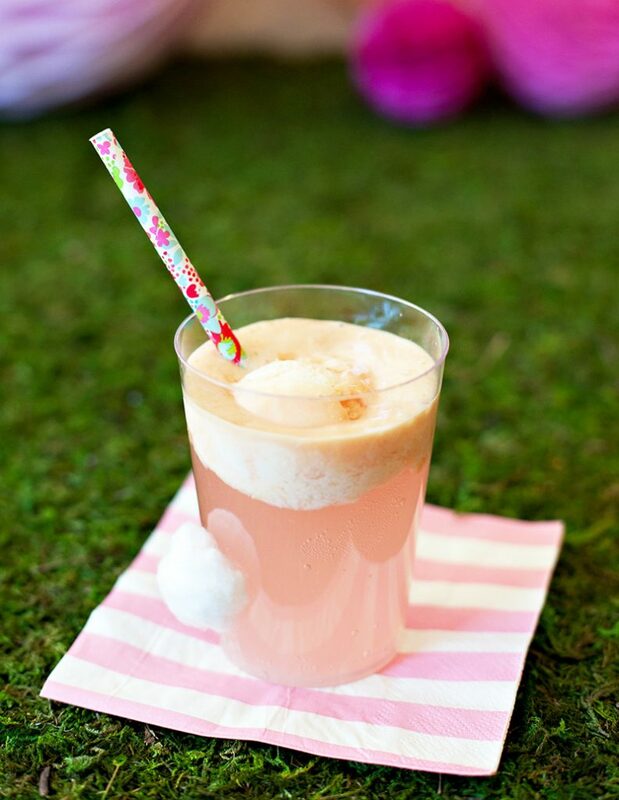 The little cotton tail on the cups is my favorite idea! 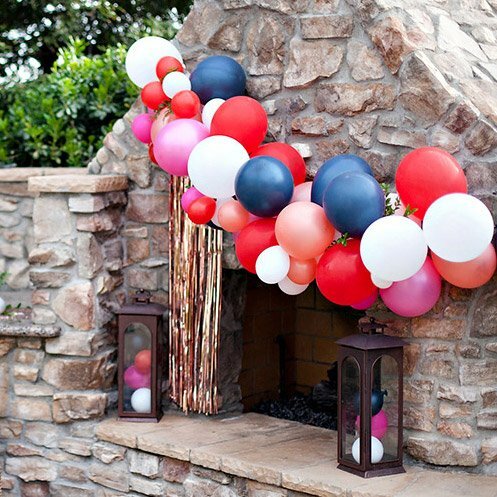 So darn adorable and so easy! I love clever little details like that that pull a whole party together. Hi! What size jars did you use the bunny ears Mahon jars ? For the ears what was use?